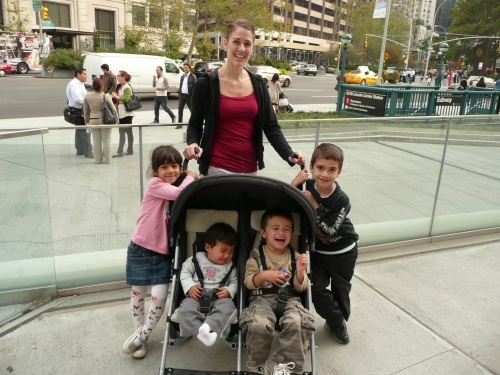 I was a bit leary when I first got the email from Monique of American Pop Social Media Marketing about the offer of free tickets for me and my family for the Big Apple Circus at Lincoln Center. I have had many offers and opportunities because of being a mom blogger, but never for anything this big before. I was probably making Monique crazy with all the back and forth and wanting to confirm things, etc. I just did not want to get all the way down to the city and be turned away leaving 4 devastated little children. Well, everything was confirmed and we were set to go. YAY! Our trip to the city was easy. We are only about 90 minutes away and since there was no traffic, we actually got there much faster. There is parking right under the circus so that was very convenient. It cost us $33. The circus started at 4:30pm and we got there around 2:30pm, ao I went and picked up our tickets and then we got to walk around a little bit in the area which was nice. There is a really nice courtyard outside the circus entrance that connects a lot of the buildings and theaters that are a part of Lincoln Center. Here we are walking around. 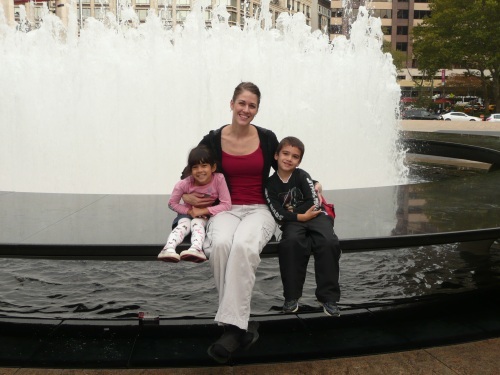 And here I am with my older 2 at the beautiful fountain in the Lincoln Center courtyard. Here we are getting ready to walk inside. 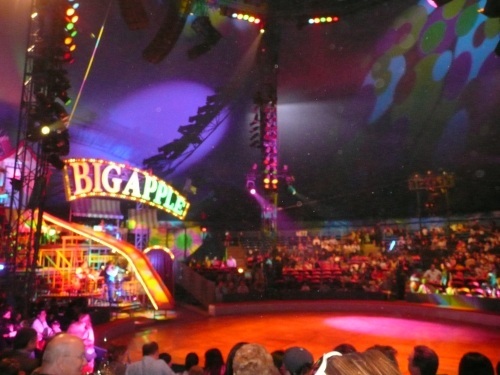 Growing up in New Jersey and now living in upstate New York, I have always wanted to go to the Big Apple Circus. But now that we are a family of 6, it is harder for us to be able to get out and enjoy things like this just because of the expense. I actually did not realize that The Big Apple Circus has several different ticket price options ranging from $25 to $175. Yes, that is a huge price difference, but honestly the tent is not all that large and you can enjoy the circus from pretty much any seat. 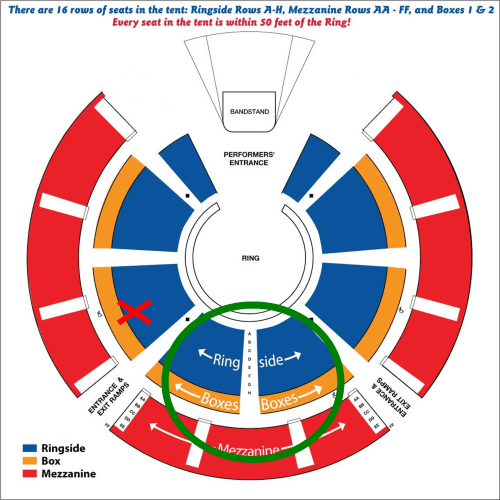 We were in the section with the red X in the picture below – definitely great seats, but if you had a choice of what seats to go with, I would suggest any seats in the green circle in the picture below. Most of the performances are facing that direction and with many of the choreographed dances and such, it would be nice to see them head on so that you can get the full affect. They do move around the ring so that all can see, but they are facing more towards the center section. Really not a big deal, but I thought I would share just in case. Well, there was a nice large entry area where the food was being sold. There were tables and chairs and benches. We grabbed our food and a table and it worked out perfect. Here is a quick shot of everyone eating. 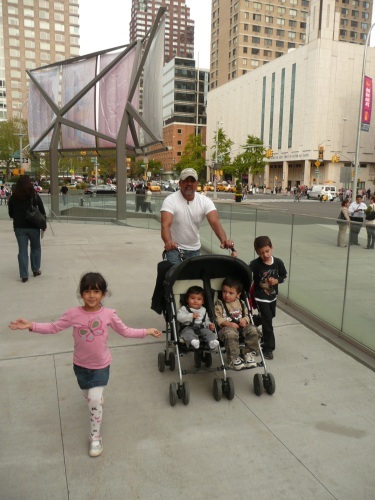 After we finished eating, we checked the stroller (yes they have a stroller check – NICE!) We then went in to get our seats and man was I grateful that we ate ahead of time. 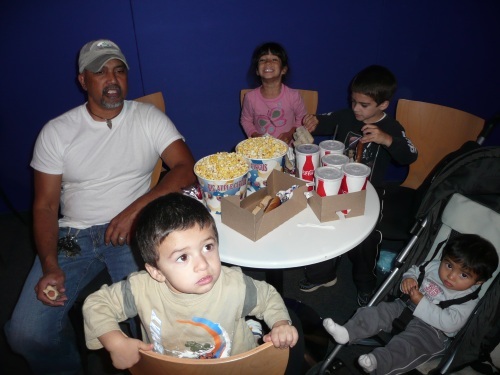 The seats are a bit tight, just enough leg room, but not quite enough to deal with 4 active children and food. 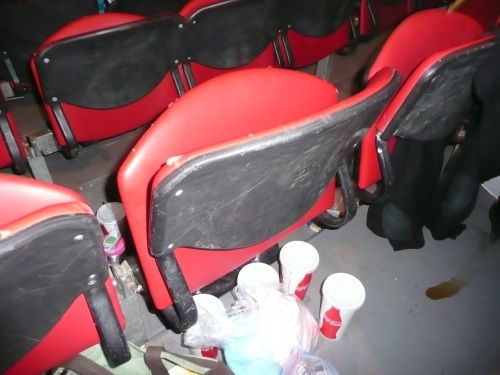 We did bring our leftover drinks and popcorn in, but you really have to be careful because they spill easily. That is one thing I noticed a lot even with the people seated around us. EVERYONE seemed like they were spilling their drinks. And if you have a bag that you are keeping on the floor at your feet – you may consider keeping it on your lap. I would suggest being very careful and not bringing in too much food especially if you are juggling small children. The kids were sooooo excited about the cotton candy. I was not so much in the beginning until the kids had just a few bites of theirs and I wound up eating the rest. Way too sweet, but definitely love the texture! Here are my sweeties eating cotton candy at the circus for the first time. The performances were great! There were unicylcists, twirlers, contortionists, a juggler, 12 beautiful miniature white horses, and of course my kid’s favorite was the funny guy with the hat who carried around the suitcase of goodies. My kids were laughing hysterically that even the people in front of us turned around and laughed just because they were laughing so hard. During the intermission we had asked someone to take a picture of us. I did a little Photoshop magic on it to fade out the people in the background. Came out nice right? So, all in all, we had an AWESOME Big Apple Circus experience. I definitely recommend that you go, no matter how old you are. We saw people of all ages, even one very elderly couple who was behind us. It really was the perfect day. The kids were very entertained. Even our 2 yr old made it through the entire 2 hour performance without any terrible breakdowns. But now for the GOOD part! I am offering an AWESOME discount for those of you who want to go to the Big Apple Circus at Lincoln Center from now until the season closes on January 9th. Online: http://bigapplecircus.org/mommy11LC.aspx and submit the code MOMMY11 in the Promotional Codes box in the lower left of the page. 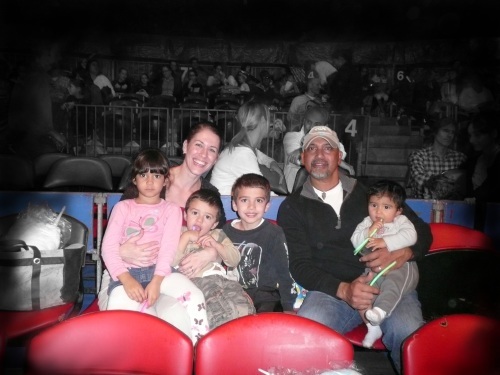 If you have gone to the Big Apple Circus or plan on going, I would love to hear from you! What was your experience like? 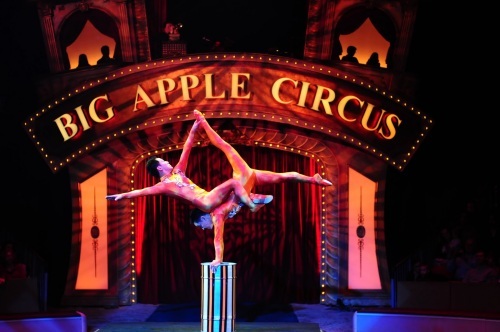 Browse: Home / Savings / Awesome Discount for the BIG APPLE CIRCUS at Lincoln Center! 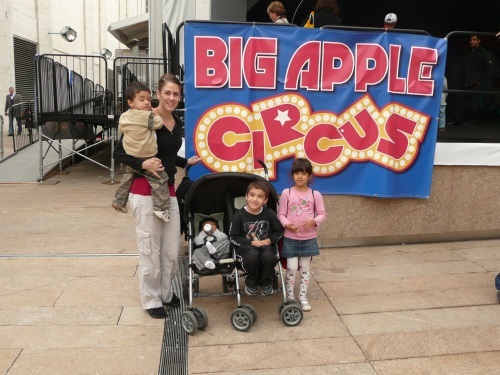 Awesome Discount for the BIG APPLE CIRCUS at Lincoln Center! The spectacular Big Apple Circus is starting it’s 33rd Season with a thrilling all-new show called Dance On! The World’s Greatest Circus artists swing into action in the spotlight under the Big Top, where no seat is more than 50 feet from the ring! This year the show will be running from October 21st to January 9th. 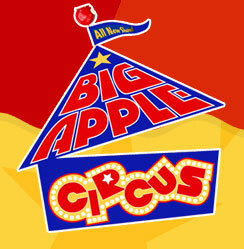 The Big Apple Circus Band will be performing LIVE music and what would a circus be without clowns? This is a show that you don’t want to miss! You will be dancing in your seats! I found this neat video on Youtube that someone posted of clips from the actual circus back in 2008. Gives you a good idea of what to expect. And keep in mind that every year the show is different, so be sure to reserve your tickets now for the new “Dance On” theme! Leslie @LaMamaNaturale´s last blog post ..Green Baking Tips- Eco Friendly Supplies &amp Ingredients! Thanks so much for telling us about your trip to the circus. I am curious to know how did your baby do at the circus? We want to take our 3 year old and I can’t decide if I should get a sitter for or bring our 16 month old? I am not sure what circus you will be going to, but we actually brought all 4 of our children including our baby (10 months) and toddler (2 yrs). They were surprisingly very entertained throughout the 2 hour show. We held them on our laps and it worked out just fine. There were a lot of different acts and music and lights that were really fun for the kids to watch. All children are different though and we were really not sure how it would go, but it worked out for us. I would give it a try unless you really don’t want to take the chance of having a toddler meltdown. I know circus tickets can be expensive. Let me know how it goes and thanks so much for taking the time to write me!